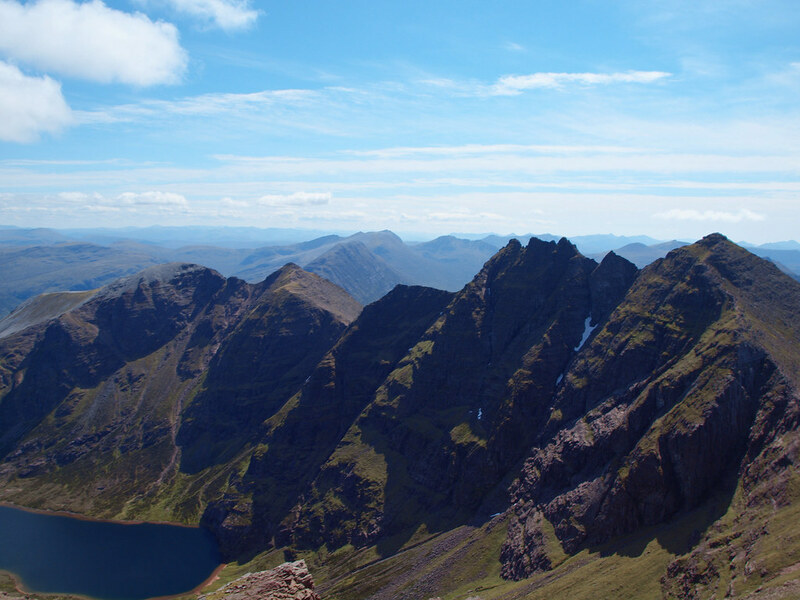 An Teallach was where it all began. My father-in-law had offered to introduce me to the mountains, so wearing borrowed boots that were at least a size too small and a leaky gortex I followed him up the path from Dundonell. He knew what he was doing, the sun was shining, we were on his favourite mountain - this was going to be a special day. The trudge up the hill was fine, but I wasn’t prepared for what was to come. We finally topped out on Bidean a Ghlas Thuill – and I was confronted by THAT VIEW. ‘BL*****DY H*****LL!! !’, was all I could manage. From that moment I was well and truly hooked. After Sgurr Fiona, a chap caught up with us as we were about to start the bypass path. Instead he headed upwards towards spikey rocky points, where was he going? The rest of the day was terrific but I had a nagging doubt in the back of my mind that I’d missed something. A few years later I was back. On a scorching day I abandoned my family on a nearby beach, and shot round to Corrie Hallie. This time, no messing about, straight up the pinnacles and danced along the knife edge. Sitting there perched on top of Lord Berkeleys Seat with my feet dangling over hundreds of feet of nothingness, munching a Mars bar and taking in the view, it dawned on me that life just doesn’t get much better than this! I had the broadest grin on my face when I caught up with the tribe on the beach, causing my mother in law to ask ‘What is it about that mountain? ?’ You just have to climb it to know. So on a bright and warm June morning we set off from Corrie Hallie along the track leading to Sheneval. We climbed steadily through the tree lined section where I once startled a sheep so badly that the poor thing fainted! (Never touched it, Your Honour, honest!). Up the zigzag section and out onto the moor with the first of the Fisherfield six coming into view. Much quicker than I remembered we reached the highest point of the path, and it was time to head up to Sail Liath. Sail Liath is one of those hills where there a number of starting points, but they all converge near the top – so just starting climbing when it feels right. It is a bit of a trudge up the steepening slopes, but the widening panoramas make the effort worthwhile. The top of the slope looks like a summit from below, rocky and fairly pointy, but it is an illusion. However, from there most of the slog is now out of the way and it is an easy walk to the true top of Sail Liath. 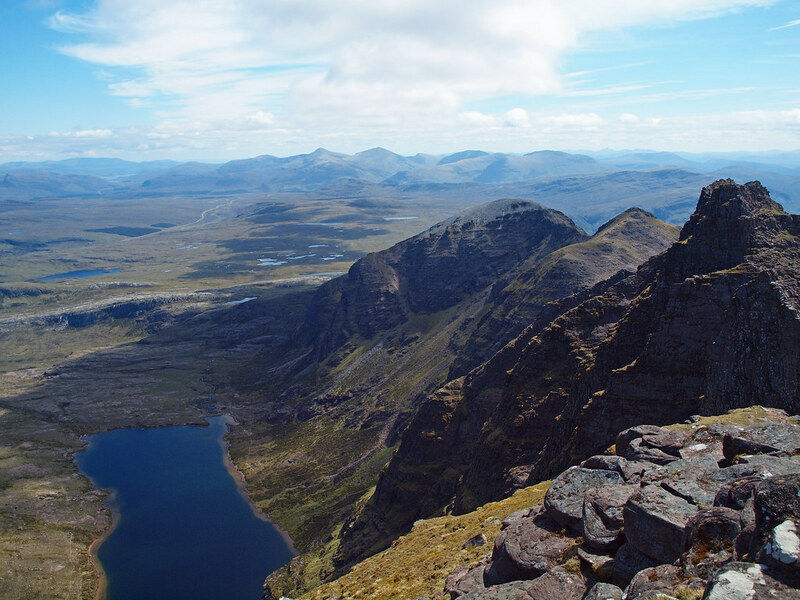 The length of the ridge from Sail Liath to Sgurr Fiona provides one of the great views of Scotland, the Fisherfield laid out in all its glory. The way ahead along the ridge is awe inspiring, pointy and exciting – oh yes! I fear that Keith was also impressed by what lay ahead, or should that read ‘alarmed’? My attempts to reassure him don’t seem to be working too well. Down the dip and up to the first of the pointy bits – the pencil tip of Stob Cadha Gobhlach. This separate spike is slightly to the left of the main ridge line, and hence it is a particularly good viewpoint, right down to the valley floor 3,000’ below. 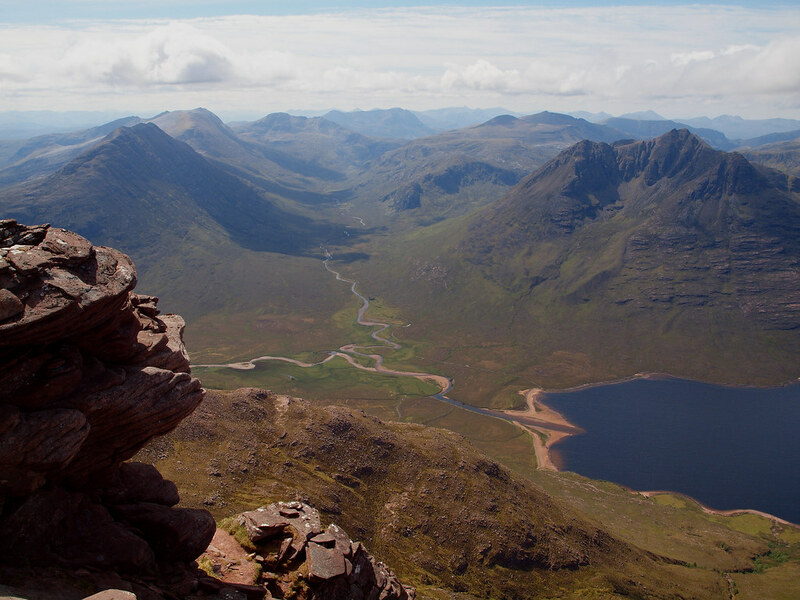 It is also the perfect place to look straight down the Gleann na Muice for the classic view of the Fisherfield Six and Beinn Dearg Mhor, particularly on a day such as this. This provided a perfect ’Strategic Photography Break’, so that Keith could get his breath back and decide which route he wants to take over the next ‘Interesting!’ section – but he’s not looking sure. The rocky descent into the gap is straight-forward, and we pause at the col where I had a bit of a wind problem last time round. I manage to avoid treading on a dragonfly, whatever are you doing up here? Looking up, the rock tower of the lower pinnacles looms overhead. I have to admit that it does look quite intimidating from below, but it is not as hard as it looks. There are also a number of paths that provide options to contour round the mountain at different heights, including one just below the pinnacle rocks themselves. As we start up I try my best to reassure Keith that he won’t have to dangle off a rock over thousands of feet of nothing (unless he wants to! ), and that the conditions are absolutely perfect today without a breath of wind. However his heart is not in it and I don’t want to wreck his day by pushing him beyond what he is happy to do. This is such a brilliant mountain that even the ‘bypass path’ beats most routes in Scotland. We agree to meet up a couple of hundred yards further on, at the foot of Lord Berkeley’s Seat. Keith is visibly relieved as he takes off down the path, and I head upwards. On a day like today, I simply could not miss out the Pinnacles! The climb to the base of the lower pinnacle seems to pass in seconds, and I am looking up at the sandstone crag. This is the hardest, longest and steepest scrambling section but the holds are many and reliable, so hold your nerve (and the rock!) and up you go. At the top, it suddenly becomes clear that this wall you have just climbed up is not very thick at all, and now you are perched on a thin parapet 1700 feet above the lake below. This is not the place for daydreaming! One thing to bear in mind is that the lower pinnacles actually slope towards the Big Drop, another good reason to tread very carefully. This first section is relatively short, and it is soon time to drop down to the gap between the lower and upper pinnacles with its weirdly shaped ‘Gendarme’. The upper pinnacles are to my mind the best part of the mountain, and I am in my element. Those breath-taking moments of focus in spectacular surroundings are what really living is all about. Another excellent and airy scramble takes you to the top with its tiny cairn that probably has to be rebuilt every year - it is so exposed that I would be amazed if it survived the winter gales, but what a view! Next comes the ‘tightrope’, a real test of balance – and vertigo. It’s like walking along a the top of a narrow winding wall, with a huge drop to the right, and it’s not much better to the left. This is not advisable in windy conditions for obvious reasons. Carefully down the end, and up to the final obstacle Lord Berkerley’s Seat. Time to relive a golden moment – up to the very top, sit down, dangle my feet over the void and take in the vista whilst chomping on a Mars Bar. Absolutely brilliant! Sitting there at the very top, the degree of overhang becomes very clear. Looking down between my feet, the ground below looks a long, long way away – mainly because it is. It’s enough to get the fingers tingling! Ah well, all good things must come to an end, time to go and meet up with Keith who should be just down there somewhere….. The narrow col between the Seat and Sgurr Fiona is narrow and well defined – but no Keith. Hmmm. I can’t imagine he would be behind me, it’s not that far – so where has he gone? Much to my surprise my mobile shows a better signal up here on An Teallach than it does at my house just outside Worcester – how does that happen!? ‘Keith?’ ‘Hello’ came the reply – that’s a relief, at least he hasn’t fallen off! ‘Where are you?’ ‘I’m at the base of Lord Berkeleys Seat, where are you?’’I’m sat on top of Lord Berkeley’s Seat and I can’t see you’. I think it occurred to both of us at the same moment that Keith had overshot, and had in fact contoured round Sgurr Fiona to the col below Bidean a Ghlas Thuill. I hopped up to the top of Sgurr Fiona, and looking around saw Keith making his way up. It was a real treat to see the expression on Keith’s face as he arrived and looked round to see the amazing 360 degree panorama for the first time. Sgurr Fiona on a fine day is a place to just sit quietly and look, there is so much to look at, and there will be few finer days than this. We lingered long, and I snapped away with my camera like a Japanese tourist – there may never be another chance like this. Eventually it was time to go, and to put the cunning plan into effect. Keith was going to contour round the Bidean so that he could return in triumph to complete the Munros later on. When we reached the col I was surprised to see how obvious the contouring path was. Do that many people just walk up from Dundonell, bag the two tops and go straight back? Keith would have no trouble at all. On the other hand I was going to make a return visit to my first Munro, you never forget your first do you? I made my way steadily up to the Bidean, That View opening up as I climbed higher and higher. ‘Hello again, my lady, it’s been too long’. 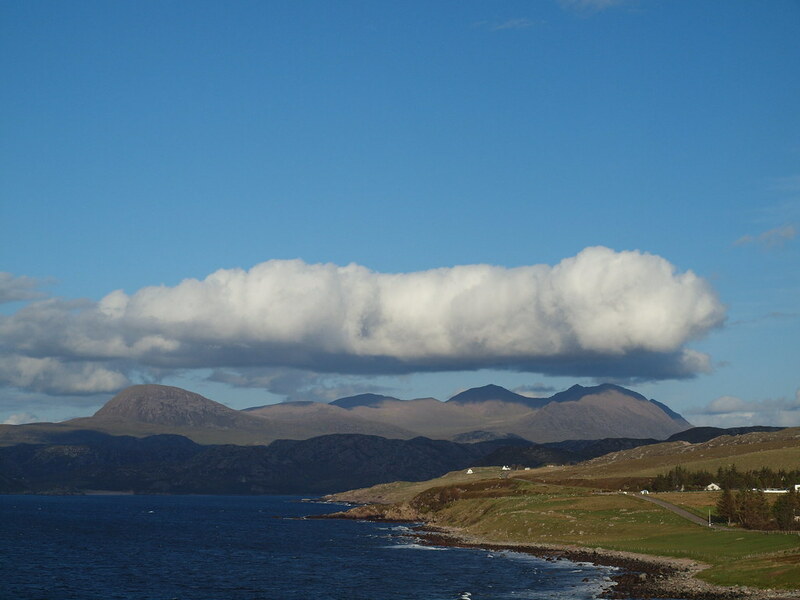 One mountain, two of the finest views you will see anywhere in these Isles. 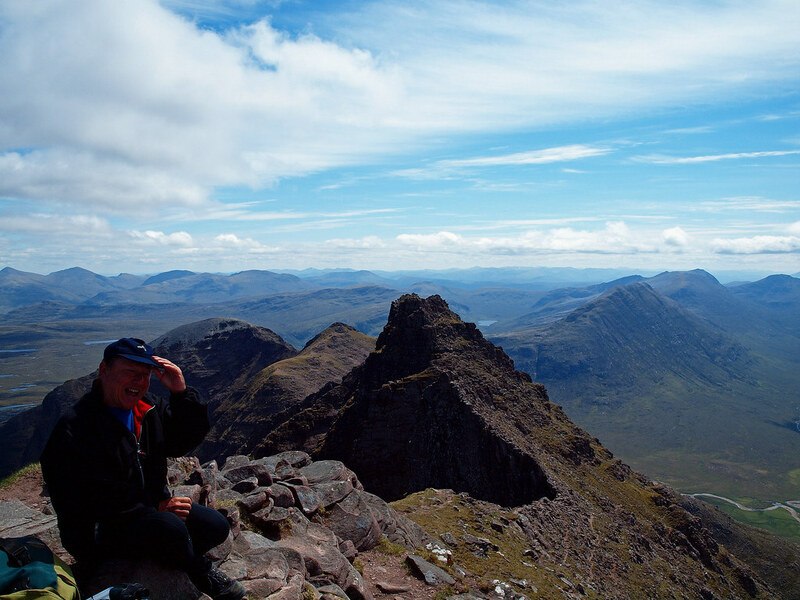 One visit to An Teallach will never be enough. I have to tear myself away, and rejoin Keith at the foot of the Bidean – he’s going to love that when he makes his return. We skip down an excellent sandy path that leads gently down An Teallach’s very own Allt a Mhuilinn with Glas Mheall Mor glistening in the sun above us. This was a truly fabulous day, and it was an absolute privilege to be able to introduce Keith to my favourite mountain. Here's a reminder of his take on a very fine day. Last edited by clivegrif on Fri Aug 10, 2012 9:00 pm, edited 2 times in total. Great pics and lots of detail, merci . Ah ha, At last! I've been waiting for you to get your act together and do your write up for this walk. It was one of the finest days I have had in the hills. I'm not so sure about my expression as being 'alarmed', I would have described it more as 'petrified', however it was worth every minute. Your pictures do the day justice, you don't get weather like that every day! Epic report. Captures the moment perfectly...must remember Mars bar and toilet paper. Apparently Lord Berkeley was partial to having a smoke on his briar whilst perched on his seat - must have been in the days before Mars Bars.... As an ex pipe smoker myself, I can't think of a better place for a puff. For those of you who have yet to climb this magnificent mountain, by Heck have you got something to look forward to!